Call is “chack” note. Song is liquid, gurgling “konk-la-ree;” ends in a trill. 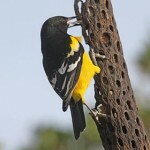 Description: Adult male is glossy black overall with red shoulder patches broadly tipped with buffy-yellow; red shoulder patch may not be visible in perched birds. Females are sparrow-like. Dark brown above and heavily streaked below; may show red tinge on wing coverts or pinkish wash on chin and throat. Habitat: Breeds in a variety of habitats, from deep marshes to emergent vegetation in lakes and reservoirs, and drier habitats such as wet meadows, ditches, hayfields, and weedy croplands. 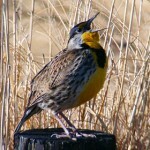 Where in Nebraska: Abundant spring and fall migrant statewide, and common to abundant summer resident across the state in suitable habitats. Frequently overwinters. 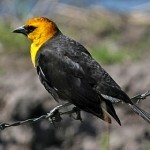 Field Notes: Often found in immense flocks with other blackbirds during winter. 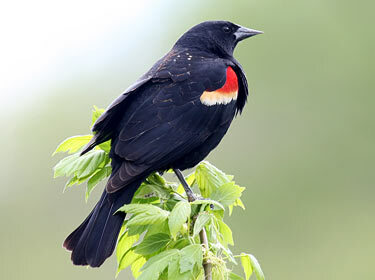 Fun Facts: Red-winged Blackbird males are often seen calling for females along roadside ditches or any type of water source during spring. They will fiercly defend their territory for hours, chasing other males and sometimes larger animals such as horses and humans. Males often form fall flocks separate from females and young. Additional Information: Considered pests because they eat grain in farmers’ fields, but also eat harmful insects during the breeding season.